Neal Van Berg of Sound Science had assembled a magical/musical ensemble here at RMAF. As usual. And, also as-per-usual, he managed to do so with gear that really hits that audiophile sweet-spot. No, I don't mean $20k+ per component -- I mean under the on that's under $10k. Way under $10k. In Scot's Audio Universe (tm), that means shooting for $5k per component. Before you go apesh!t, consider that I not saying that this means that it's affordable. Because it's not. 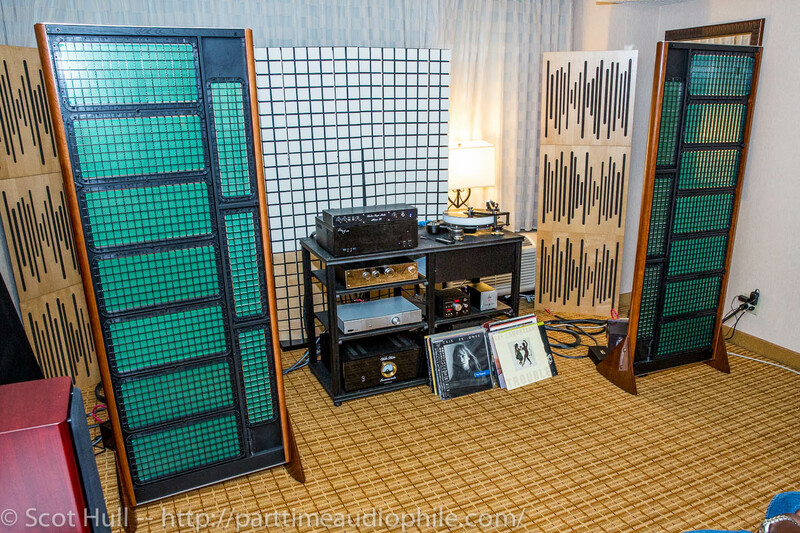 But it is aspirational -- and it hits a level that I think many audiophiles might possibly be able to strive for. As opposed to, say, an amplifier that costs more than a minivan. Equivocations aside, Neal managed to assemble a serious, and seriously high-end, system that most audiophiles can at least aspire to, even if they'd tend toward the minivan. Perhaps more interestingly, it was with that gear that he managed to create an audio experience that didn't just approach the ultramegabuck systems up and down the tower at RMAF. It equaled them. And that was some seriously cool work. How he got there … lets start at the back. 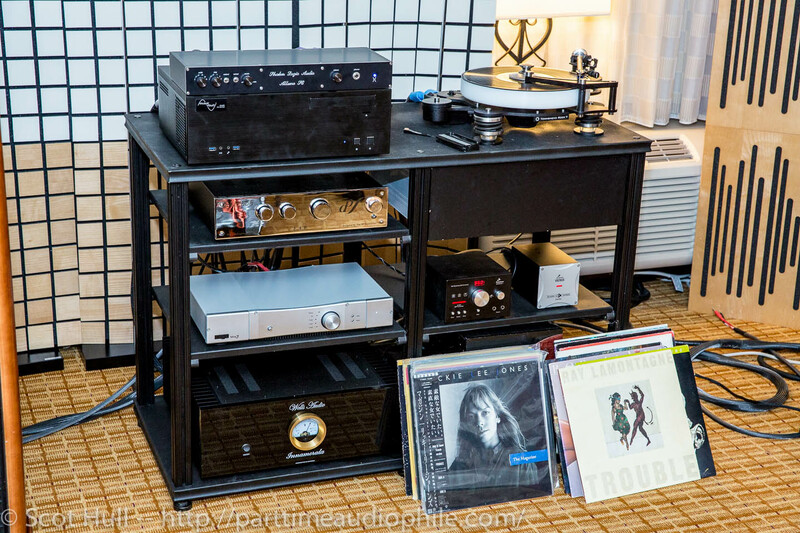 Antelope Audio provided a variety of their latest offerings for our listening pleasure; Friday saw a Zodiac Gold DAC ($4,495 w/ Voltikus PSU), the new Platinum appeared on Saturday ($5,500 w/ Voltikus PSU), and not to be outdone, the stunning Rubicon stepped in on Sunday ($40k — and yes, this completely blew that carefully constructed “aspirational” story completely out of the water, but what the hell). 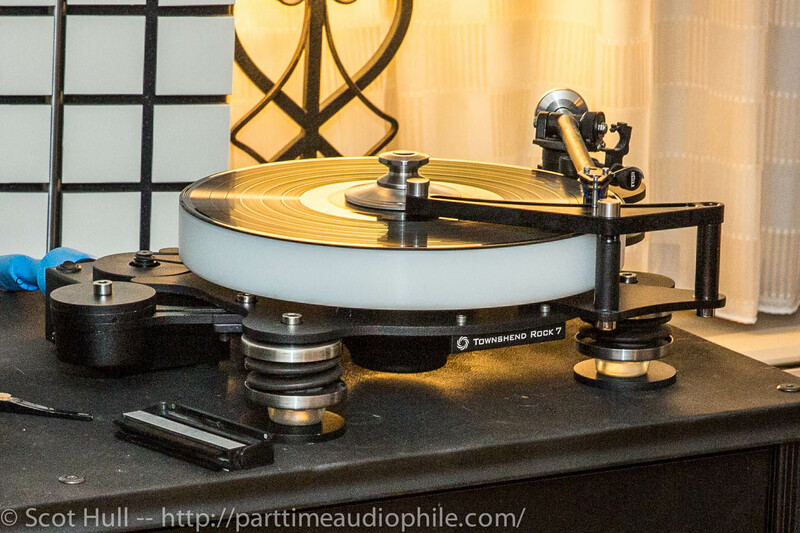 On the analog end of the source-chain, I found one of my personal favorites in the turntable space, the Townshend Rock 7. It’s a suspended design, but features a unique (to me, at least) way to dampen vibrations. The ‘table incorporates a trough that can be filled with damping fluid; a headshell attachment allows this arrangement to radically isolate exactly where it’s needed most — at the stylus. 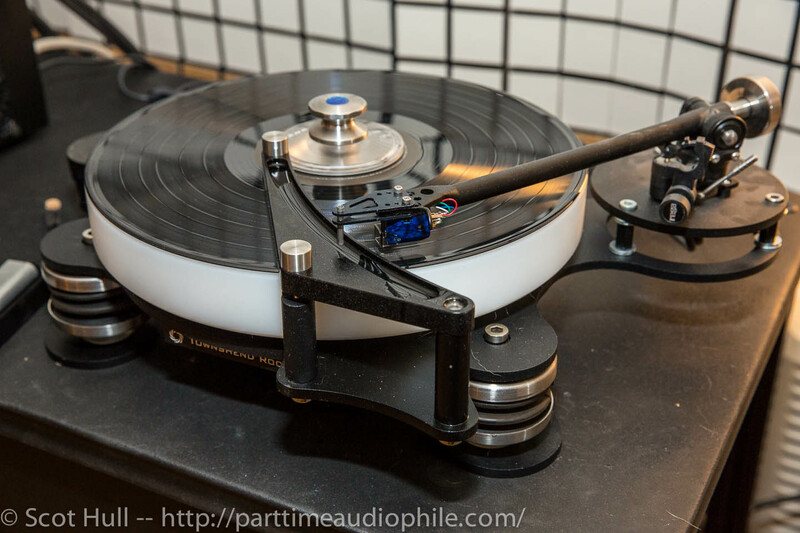 The Rock 7 retails for $3,900 (w/o a tonearm). 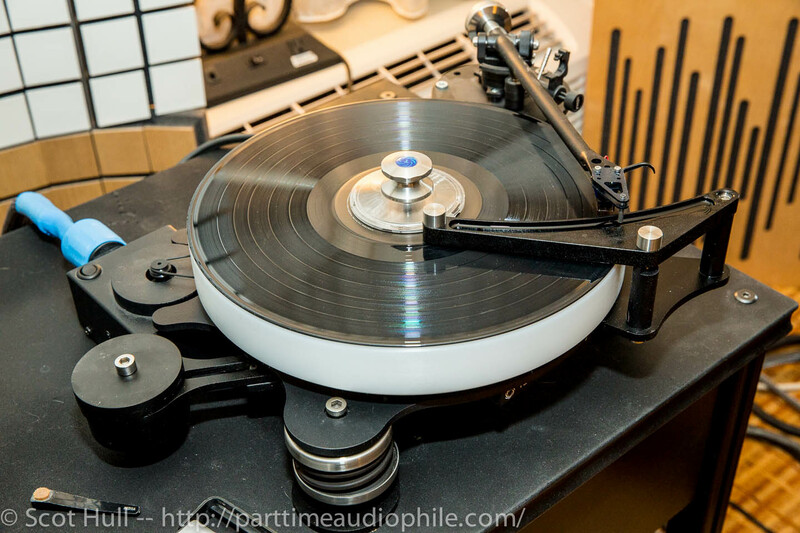 It was mounted here with a Rega 301 tonearm and a Rondo Blue cartridge. 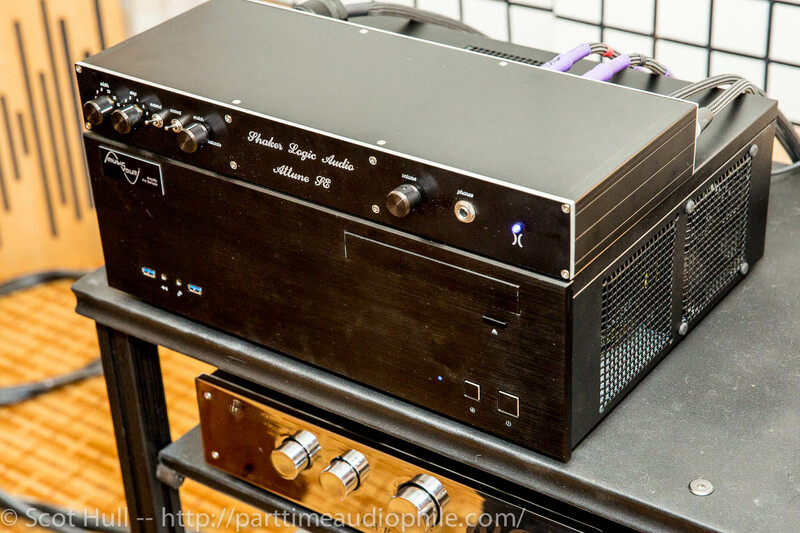 The EAR 868 ($7,395 w/ internal phono) preamplifier made the connection from sources to the Wells Audio Innamorata Power Amplifier ($6,495). 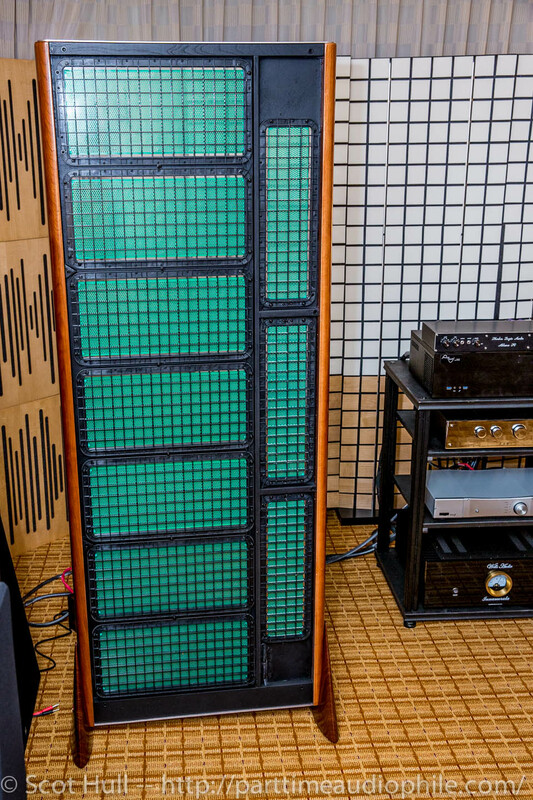 Speakers were the King Sound King III (recently increased to $14,995/pair) full-range panels. They’re ESLs, so the resolution goes without saying. But they also play loud, and with real bass, which does require mentioning. 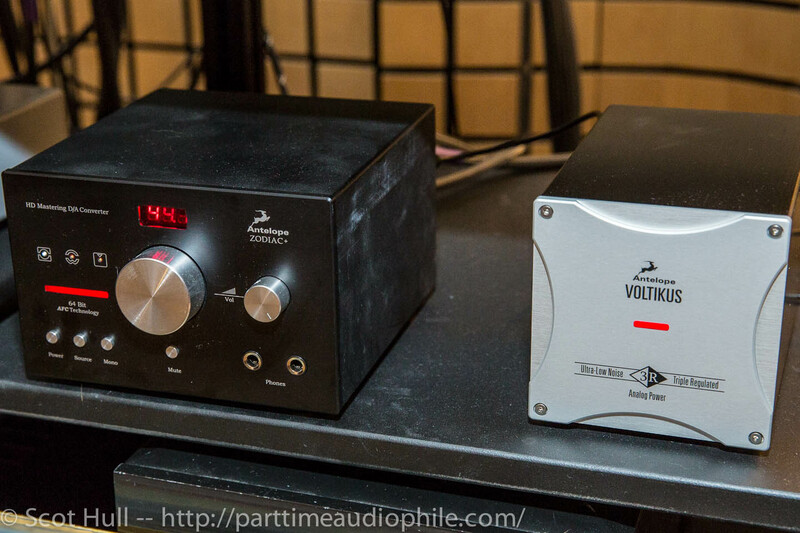 Interesting note: the King Sound line has the lowest polarization voltage of any ESL speaker (only 18 volts!). Kaplan Cables were used throughout. 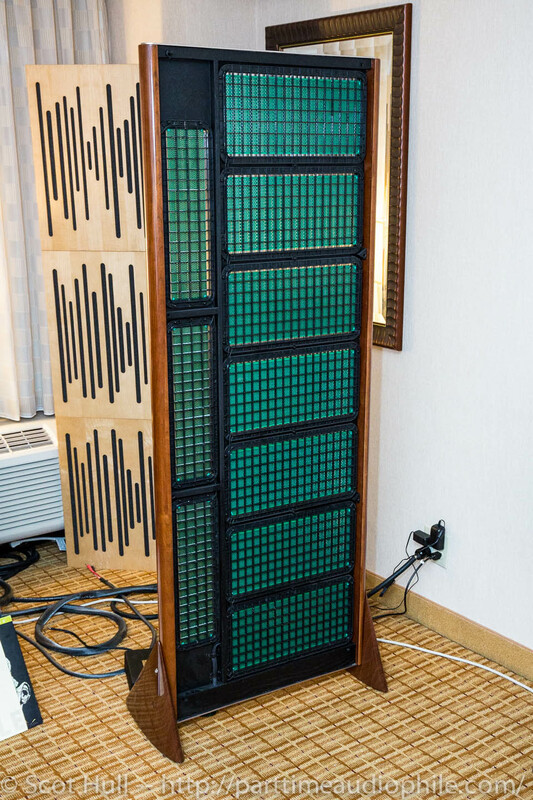 An unusual element in the mix was the Shaker Logic “Attune SE” ($2,495), an all-analog device that “compensates for the baffle-step of your loudspeaker”, a problem that generally decreases resolution. With the Attune, dialed in for the 2′ wide King IIIs, the device was said to increase center-fill and allows bass to extend fully. I didn’t get to demo this, unfortunately, but I’m told a certain editor at a certain magazine was struck by the improvement. Would getting near the king sound electro stats cause a implantable defribelator damage or fire? Just wondering. I think you’re teasing but in case you aren’t the answer is no as the Charge is not varying it is fixed so it doesn’t radiate into anything.